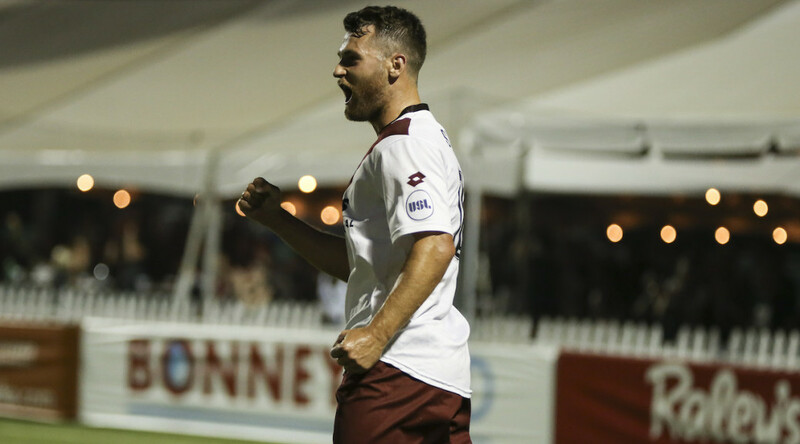 Stewart’s penalty is enough as Republic FC earn first victory of 2016 USL season. 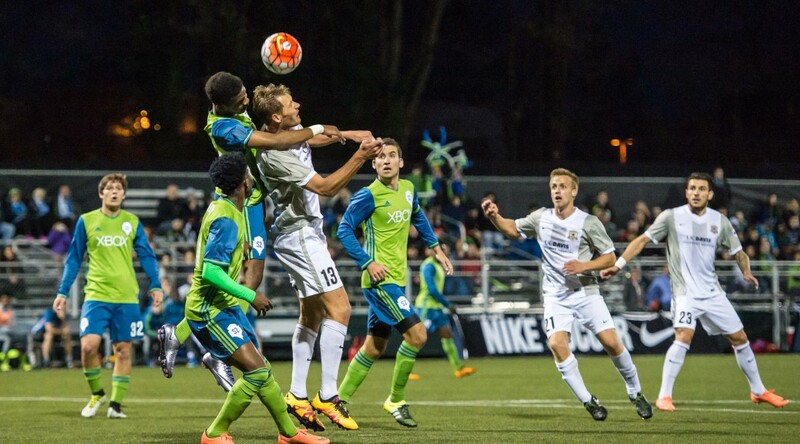 Sacramento Republic FC kicked off their 2016 USL season on Friday with a bang, earning three road points against Seattle Sounders FC 2 in their first match-up of the season with a 1-0 win. 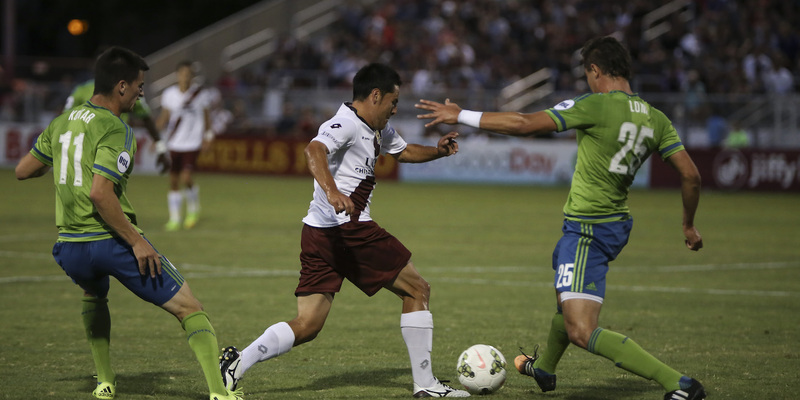 Sacramento Republic FC started the match with constant, sustained pressure on the Seattle Sounders FC 2 defense. In just the 5th minute, Republic FC earned their first chance of the night as forward Thomas Stewart worked his way past the S2 defense on the left side of the box and sent a cross in front of goal towards Danny Barrera and Adam Jahn, who were both sprinting up the pitch. Both Barrera and Jahn slid toward the ball, but the cross bounced just past both players’ reach and rolled harmlessly past the goal. Despite the early chance for Republic FC, the match quickly leveled out for both sides, with the majority of the play contained to the middle of the pitch for the first half and few looks for either side toward goal. S2’s best look at goal came in the 42nd minute when forward Aaron Kovar received the ball on a breakaway on the right side of the pitch. Kovar slowed near the right corner of the box, stepped over the ball a few times before firing a strong left footed shot toward goal, but Republic FC goalkeeper Dominik Jakubek was in position to easily save the ball and preserve the empty scoreline. The second half started slower than the first half with both clubs looking to gain an advantage. S2 had the first solid look on goal in the 48th minute when forward Darwin Jones beat the defense down the left side of the pitch, but were unable to score. Jones took the ball to the endline near the edge of the six-yard box before sending a shot toward the top left corner of the goal. The shot had good pace, but was just high and wide right of the goal. Republic FC finally broke the scoreless deadlock in the 63rd minute. Jahn was taken down on the right side of the box while trying to run down a through ball, earning Republic FC a penalty kick. Stewart stepped up to take the penalty and sent a strong low shot to the right and past S2 keeper Charlie Lyon, who dove to the left, giving Republic FC a 1-0 lead. 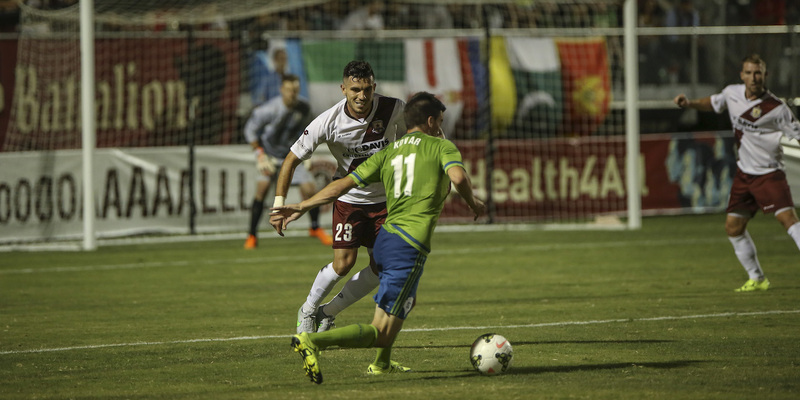 S2 looked to respond with a constant barrage of attacks, but were unable to break through Republic FC’s strong defense. S2’s best chance of the second half came in the 76th minute. Kovar received the ball behind the defense on the left side. The forward pushed the ball toward goal and just outside of the box tried to slide a cross to the middle but the ball was deflected toward goal. Jakubek who had been moving to defend the cross was able to quickly change direction, diving back to his right and making the save to preserve his shutout. Republic FC return home to host Arizona United SC in their 2016 USL Home Opener on Saturday, Apr. 2 at Bonney Field. Kickoff is 7:30 p.m. Tickets are on sale at Ticketmaster.com. Misconduct Summary: SRFC – Agustin Cazarez (caution) 60, Tommy Thompson (caution) 67. Sacramento Republic FC – Dominik Jakubek; Emrah Klimenta, Derek Foran, Chris Christian, James Kiffe; Agustin Cazarez, JJ Koval, Danny Barrera, Tommy Thompson (Alfonso Motagalvan 90); Tommy Stewart, Adam Jahn (Cameon Iwasa 80). Subs Not Used: Evan Newton, Mike da Fonte, Max Alvarez, Ivan Mirković, Chase Minter. 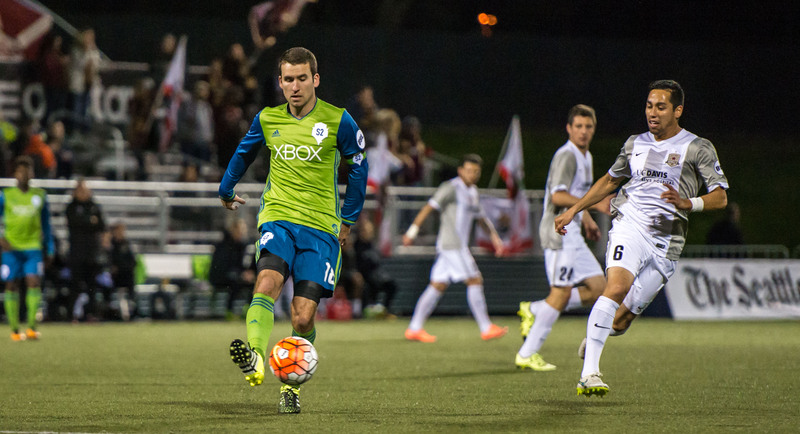 Seattle Sounders FC 2 – Charlie Lyon; Oniel Fisher, Tobi Jnohope, Tony Alfaro, Dylan Alfaro, Dyln Remick; Michael Farfan (Emir Alihodzic 46), Nathan Sturgis, Zach Mathers (Nkongho O’Ojong 88); Darwin Jones, Andy Craven (Handwalla Bwana 73), Aaron Kovar (Nick Hinds 88). Sacramento, California – Sacramento Republic FC capture a win in Buckle’s USL debut behind a brace from Thomas Stewart. After an even first half hour in the match, with both teams seeing their fair share of possession, Seattle saw the first real chance of the match in the 30th minute. Midfielder Aaron Kovar got behind the Republic FC defense on a long through ball in the air and had a one-on-one encounter with Mickey Daly in the box. Daly was called for a foul after Kovar went to ground. Kovar then stepped up to the penalty spot and pushed his shot wide of the post keeping the match scoreless. Republic FC got on the score sheet shortly after in the 37th minute when midfielder Rodrigo Lopez sent a threatening through ball up the middle for forward Thomas Stewart. The target-man Stewart was able to run onto the ball and send a first-touch howler on goal. Seattle keeper Charlie Lyon dove to his right and was able to deflect the ball, but Stewart’s shot had too much pace on it as it hit the inside of the far post and into the back of the net for a 1-0 Republic FC lead. With the assist on Stewart’s first-half goal, Rodrigo Lopez became the all-time USL assists leader. The goal was Stewart’s first in USL play in 2015 and his sixth in all competitions. 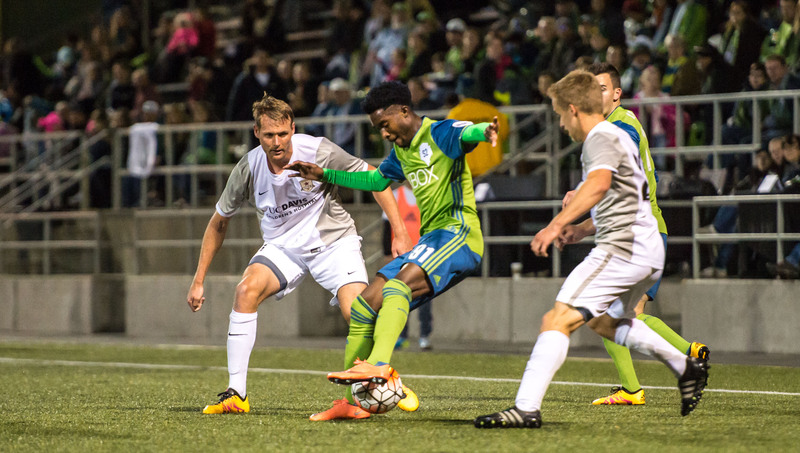 The match came to halt in the 76th minute when Seattle defender Amadou Sanyang went in dangerously with a tackle on Republic FC midfielder Octavio Guzman. Sanyang was shown a straight red card and Guzman was subbed out with a right knee injury. Republic FC would add a second goal in the 83rd minute when Stewart beat an offside trap and ran onto a long through ball from midfielder Danny Barrera. Stewart was by himself and only had the keeper to beat as he initially tried to chip the oncoming Lyon. The Seattle keeper blocked it right back to Stewart, who took two more touches towards the empty net and slotted home his second goal of the match, putting Republic FC ahead 2-0. The win was snaps a three-match winless streak for Republic FC and moves them within three points of first place LA Galaxy II. Republic FC keeper Patrick McLain recorded his sixth shutout of the season, the fourth at Bonney Field.